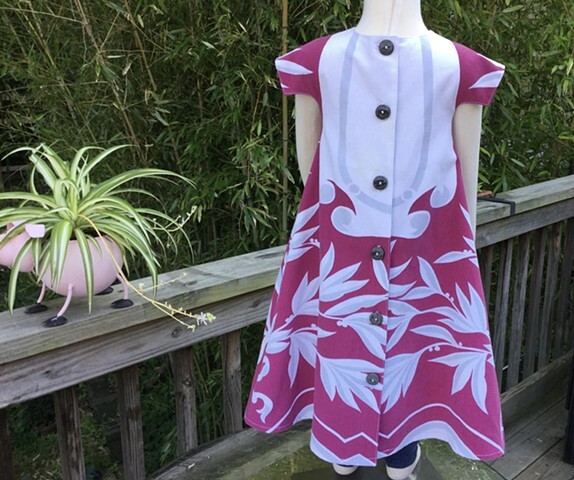 Made from an exquisite vintage tablecloth in a bold combination of orchid and pale blue, size L (5-6 years) dress measures 22” across chest and 25” long shoulder to hem. Deep inverted pleat in the front flares into wide skirt, built-in cap sleeves, bodice and pockets faced in tiny blue-gray checks. Buttoned pockets emphasize unique print detail, closes all the way down the back for easy on-off, round collar features check fabric and decorative stitching. $110, all cotton, hand washable, made by the designer herself and shipped free to any address in the U.S. #250.